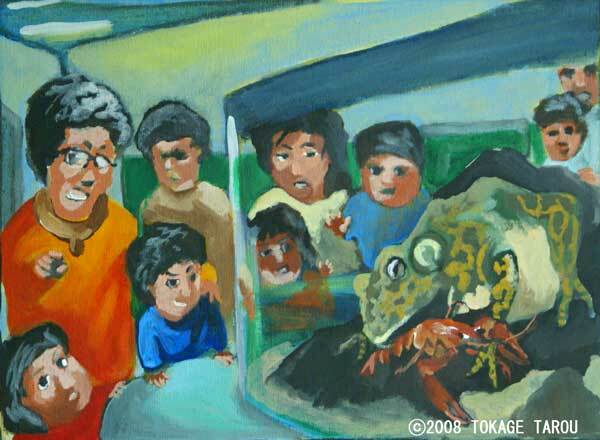 Special Report 2008 Year of the Frog Jack reported how Inokashira Park Zoo participated the worldwide campaign to protect frogs and other amphibians. Many More Animals at Inokashira Park Zoo!! The domestic frogs have been already here. All kinds of fresh water fish, amphibians and aquatic insects are exhibited in the Aquatic Life House of Inokashira Zoo. 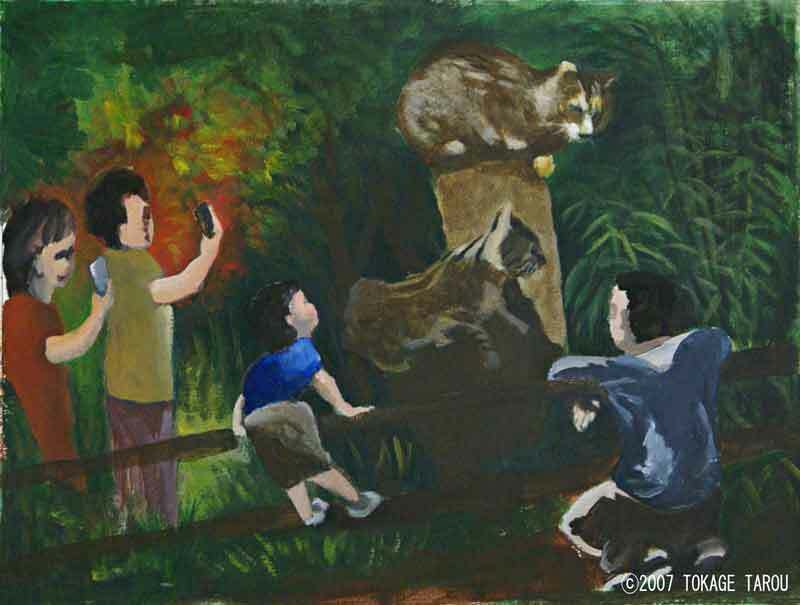 Inokashira Zoo is specializing in indigenous species of Japan. 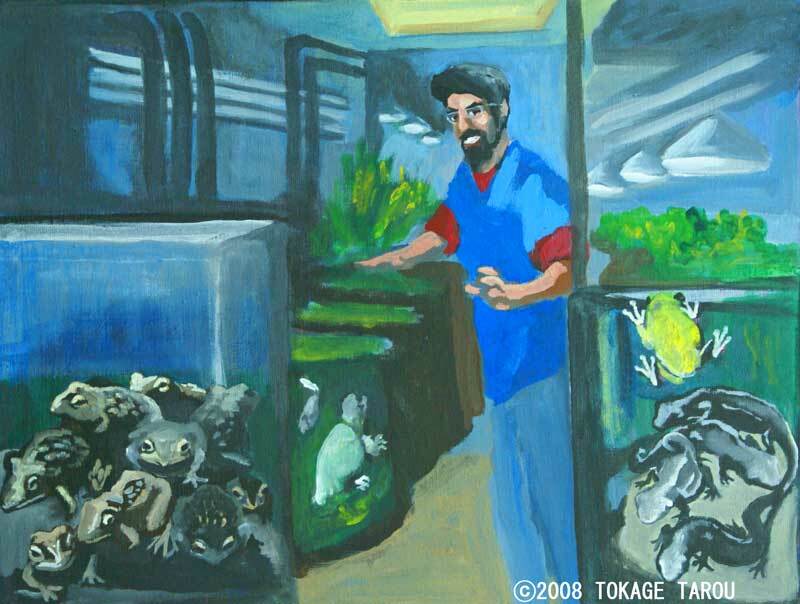 The zoo has joined the program 2008 – Year of the Frog to protect domestic frogs, but conservation of the frogs is not the new project for Inokahira Zoo. Unfortunately in Tokyo, local amphibians are diminishing. The sewage from the drain contaminates their habitats. Wetlands are disappearing by expanding residential area. The zookeeper, Hiroshi Arai also pointed out another reason of disappearing aquatic creatures. that brooks and streams which connect to wetlands and small ponds are cut off. “Frog, amphibian and water insect move to another place for mating, laying eggs or looking for more suitable habitat. But it is very hard for them to move from one wetland to another”, said he. 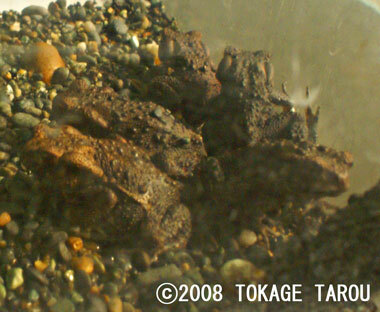 To participate the project of 2008 – Year of the Frog, Inokashira Zoo has been breeding and rearing the Wrinkled Frog (Glendirana rugosa) and the Japanese Fire Belly Newt (Cynops pyrrhogaster). The Wrinkled Frog is easier to rear in a captivity because they don’t take a big jump. The zoo has more than 200 frogs, which have left water to land after growing legs from tadpoles. The Eastern-Japanese Common Toad (Bufo japonicus formosus) is also bred in the zoo. The frog is quite common in this local area, but it is not easy to rear it in captivity. The frog needs both water and land, but young frog could be drowned if you fill water too much. So zookeepers are always careful about the population of frogs and how fast they grow in the tank. Inokashira Zoo breeds and rears the Japanese Fire Belly Newt with corporation by Kasai Rinkai Aquarium. This newt used to be able to be found even in downtown Tokyo, but it is only found in suburb area now. Even though it is not endangered species yet, the zoo wants visitors to discovere the fascinating newt. The hungry frog is the super star. The zoo also displays the Forest Green Tree Frog (Rhacophorus arboreus), The Japanese Tree Frog (Hyla japonica) and others are exhibited. Among them, the American Bullfrog is very popular. His large body catches the visitors’ eyes. He was found in a residence nearby. He had a big boil when he came to the zoo. The boil made him decline his appetite. So, he was treated and very healthy then. He has a hearty appetite and sometimes he eats too much. He eats a whole mouse sometimes otherwise he gets slimmed down. Crayfish is his daily meal in the zoo. If you are lucky, you can see him devouring crayfish with his tongue. Stop and take a look. They are very rare now! The Aquatic Life House of Inokashira Zoo has more. 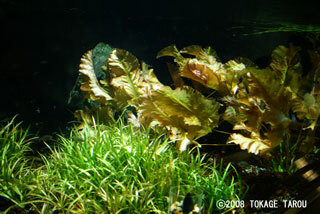 The Miyatanago (Tanakia tanago) is the national natural treasure. The Musashitomino is the little fish, which is endemic to Kumagaya city in Saitama. 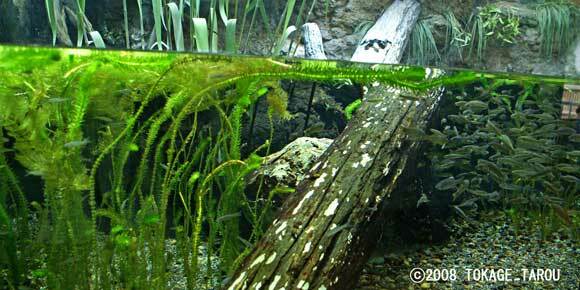 Maybe because they are little and hiding behind water plants, people easily pass by the tank. The zookeepers relocate the water plants and stones or change the light effect to get the visitors attention to the very rare fish. 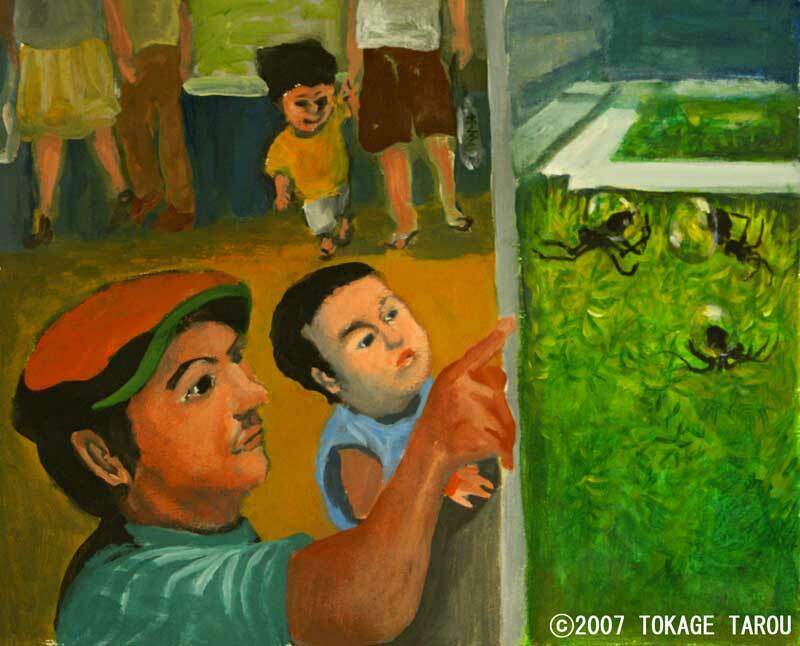 Inokashira Zoo has held special exhibitions and events related to Year of the Frog in 2008. Wow! Look how they live! The Air Breathing Water Spider traps a layer of air over its breathing hole, using hairs on its legs and abdomen. He also keeps a reserve of extra air in a beautiful silky silvery diving bell made from his web silk, which he attaches to a nearby plant. Where is that Japanese Squirrel? Even the adults are enthusiastically searching. The squirrel path way takes you through the cage, where searching among the close leaves and branches will reward the patient observer. Look carefully, quick. There she is! Hey, We get to pet them? Guinea Pigs like to be held in your hands. Plump and furry, so cute. When you pet them they look so happy and relaxed. says dad, but the son is too busy taking care of this darling fur ball. 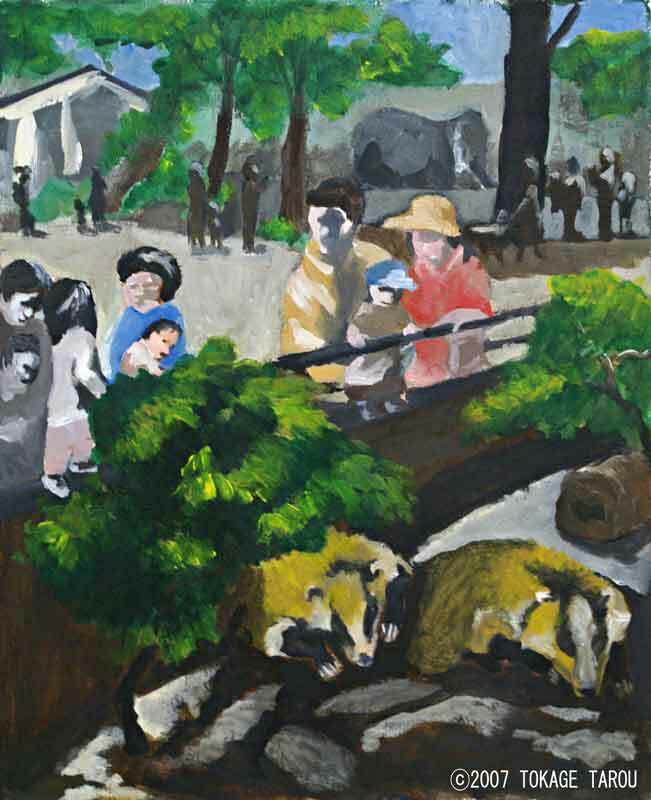 The Japanese Badger name anakuma means ground bear. Anakuma looks a lot like a fat racoon. Anakuma the badger is so uncomfortable on hot days, but his shiny gold coat gives him a western blond look. Our Siberian Cat guests mumble, "Day time is for sleeping!" Tokyo's hot days are hard for these cats, the amu-ru yamaneko. "I'm from Siberea, you know - Meoooow!" 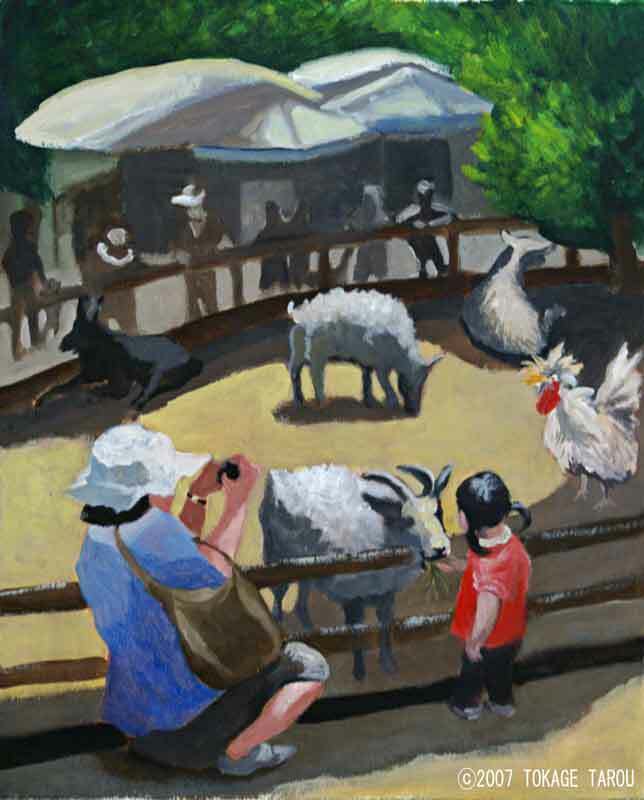 Yagi-san, the goat, is so popular in a small zoo. Kids like to touch his beard. 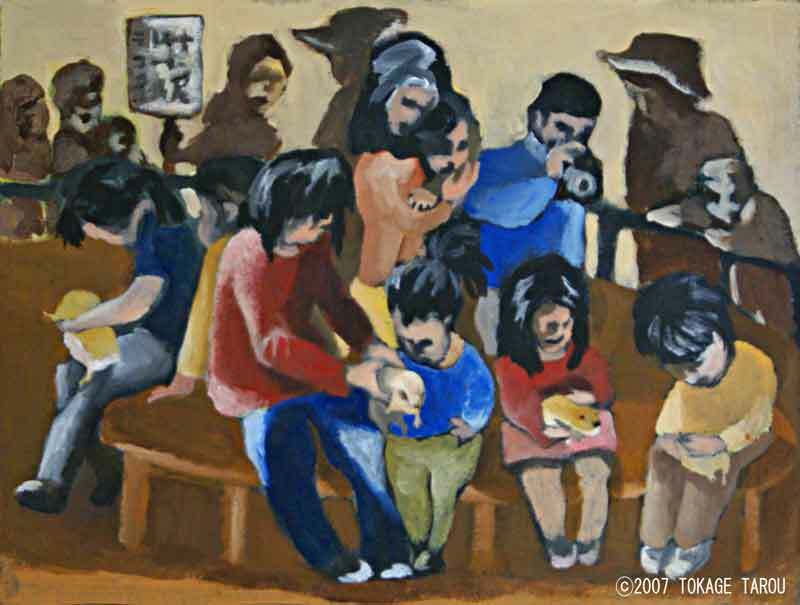 At the centre of the zoo is the petting corral. You can pet Yagi-san, the goat, and see his friend Afro-hair chicken. She loves to pet him during mom's picture. 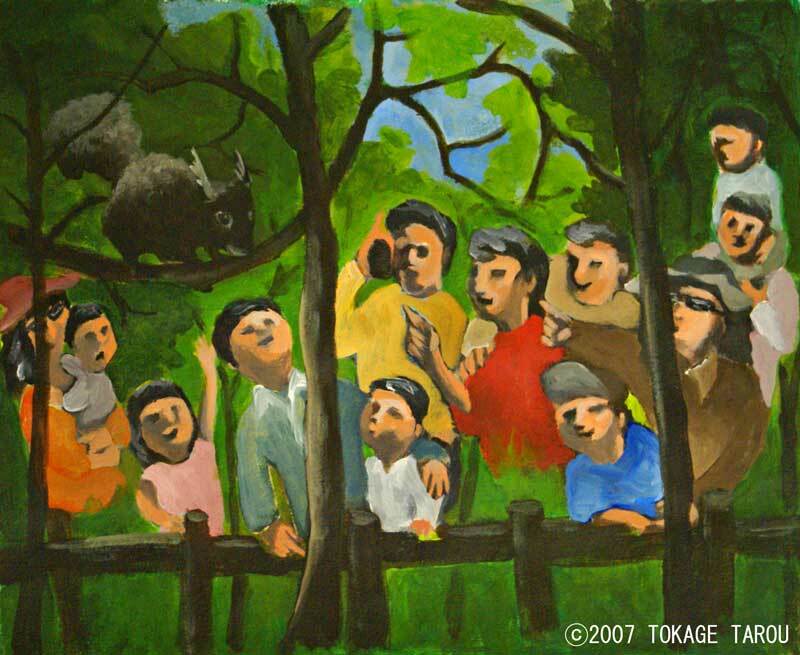 Mr. Seibou Kitamura's Art works. The Kitamura Studio is in the northwest corner. 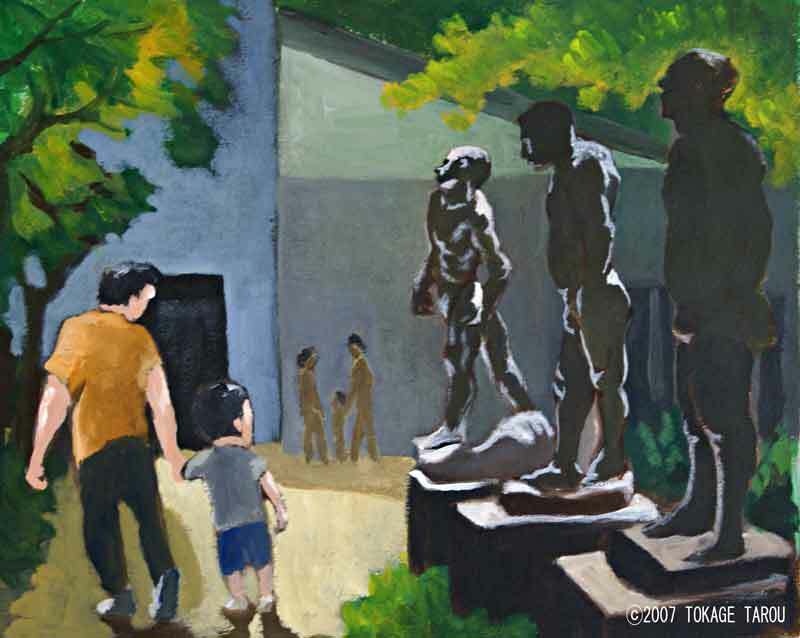 Known for his "Peace Statue" in Nagasaki, you can see his lion and human works in the forest. The shady spots here draw many nearby for family lunch.